This was my go to quick snack after a long day of woking as a nanny in NYC. I would get home around 7:30 if I was lucky, usually too late for a big dinner but I needed something healthy and fast! 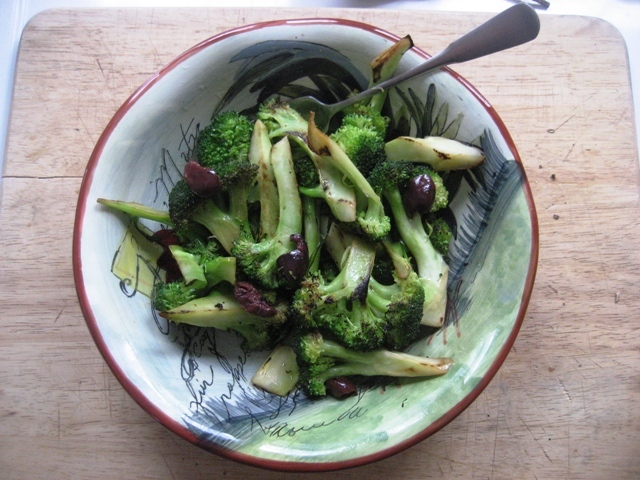 If you keep chopped broccoli on hand, this is even easier. 1 head of broccoli, chopped into manageable pieces. Save the stem for coleslaw! 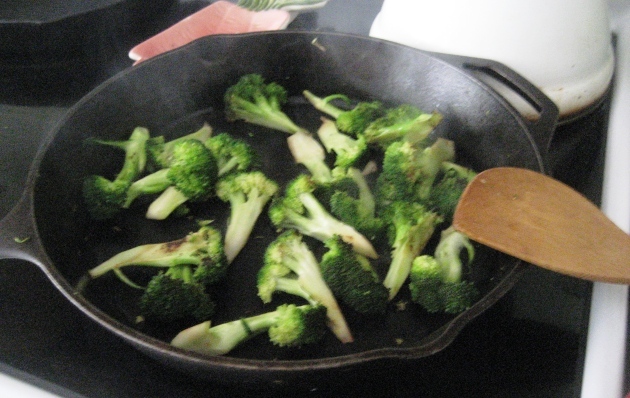 Throw the broccoli into a sauce pan (or cast iron skillet) with about an inch of water in the bottom, put a lid on it and turn the heat to high. Let the broccoli steam until it turns bright green, you just want to cook it a bit, it should definitly have some crunch to it! Drain whatever water is left, put the pan back on the high heat, add a little drizzle of olive oil, not too much, you want to brown the broccoli and that won’t happen if you add too much oil, I’d say about 2 teaspoons. Toss the broccoli around so it gets coated with the oil and doesn’t burn. When it’s getting some nice brown spots, add the olives, and the lemon, the juice will steam and sizzle and you’re DONE! This is a great healthy snack or side dish. It takes just a few minutes to make and would always make me feel a little more energized and take the edge off my hunger after a long work day!